Couldn't come up with a title for todays post. It has been a good day for Sam. Unfortunately he is more congested today than yesterday. It is progressively getting worse it would seem. It stinks that we have just finished the antibiotics on sunday, and already he is starting to get it again:-( Not sure what the plan will be regarding this. Today I learned of a little girl who has gone on to be with the Lord today. She was 8yrs old and has been battling cancer for two years. 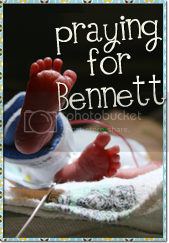 I would ask you to please pray for her family, her twin brother, and her two other siblings, one in kindergaten and one that is six months. Please lift this family continuously in your prayers. Sammy's little friend Josiah is also in the hospital. He is having some respiratory difficulties and is requiring frequent nebulizer treatments. 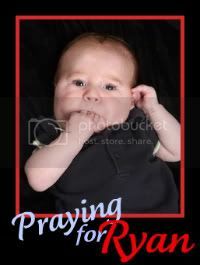 Please keep Josiah, and his family in your prayers as well. I have been working on a special project recently and have been going through tons of pictures, look at this!!!! 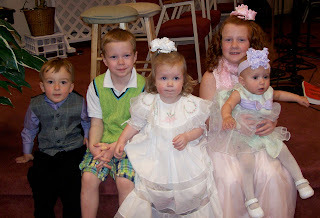 This is from Easter 2009. Look how little Sammy was, and Sophia was such a little peanut. Hey Danielle, Awesome to read your blog. I shall be a frequent visitor!